In the 1968 cult horror classic Night of the Living Dead, Director and Co-Writer George Romero set the bar for all Zombie films to follow. In the film, Romero introduces his audience to flesh-eating zombies, the dead brought back to life by the radiation from a fallen satellite. A work of fiction, it’s unsettling ending was the source of more than a few nightmares among those who witnessed it in theaters and later on television, video, and DVD. 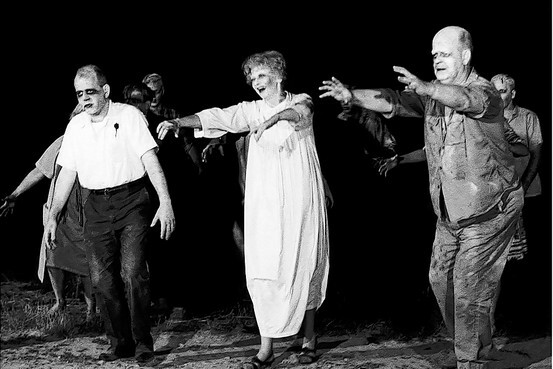 Like Godzilla and giant mutant spiders and ants that were radioactively-spawned monsters of the 1950’s silver screen era, Romero’s zombies were terrifying to their audiences for the simple reason that it seemed entirely believable to most people that radiation could cause such mutations. A zombie or other malevolent creature might be just one atomic explosion away. And, like the unknowing, innocent victims in Romero’s Night of the Living Dead, anyone might fall prey to flesh-eating zombies lurking in their very neighborhoods. While that might seem preposterous to some, the folks populating the U.S. Centers for Disease Control and Prevention (CDC) would not be among them. Last year, they published an emergency preparedness bulletin entitled Preparedness 101: Zombie Pandemic. Officially described as “a tongue in cheek campaign to engage new audiences with preparedness messages,” the bulletin takes on new meaning in light of recent events. In Miami this week, police were summoned to the scene of a disturbance by reports that two men were fighting. When they arrived, they were horrified by the sight of a naked man in the act of eating the face of his prone victim. Upon being struck by a bullet fired by one of the responding law enforcement officers, the perpetrator continued his attack (or meal) until being killed by another shot from the officer’s revolver. The victim, if he survives, will have quite a story to share and years of therapy to undergo. Editor - who has written 408 posts on Write On New Jersey. After reading this story, I conclude the cause of cannibalism stems from the high cost of meat in our society. Have you seen the prices they want for meat? They say man cannot live by bread alone, but this is getting ridiculous.